Categories: 4-20 mA, Digital, NFC & Bluetooth, Output, Type Of Transmitter, Transmitters, Approvals, ATEX Ex ia, FM, IECEx, Input, Potentiometer, RTD, Thermocouples, Universal, Isolation, Isolated, Measuring Channels, 1 Measuring channel, Design, Head Mounted. IPAQ C330 is a modern temperature transmitter developed to meet the highest requirements on flexibility, accuracy and reliability. 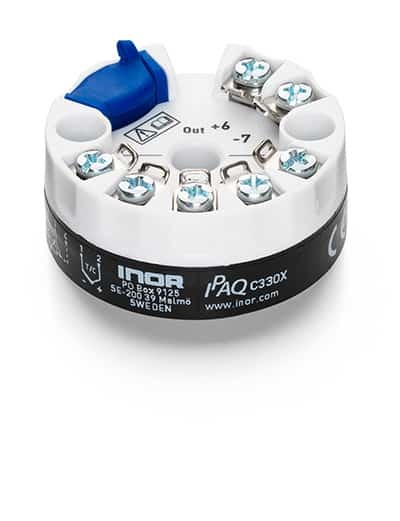 A universal transmitter compatible with RTD, thermocouples, voltage and potentiometer sensors to offer high flexibility and reduce the number of installed product variants. IPAQ C330 is available with ATEX, IECEx and cFMus certifications, making it a safe choice for a wide range of applications. IPAQ C330 supports wireless communication via NFC® (Near- field communication) and Bluetooth® which makes it possible to configure and monitor the transmitter through a smartphone or a tablet. Is it possible to replace my IPAQ-H directly with an IPAQ C330? Yes, please follow the instructions to ensure that you connect the transmitter correctly. What are the advantages of IPAQ C330 compared to IPAQ-H? Can I configure and monitor the IPAQ C330 wirelessly? Yes, IPAQ C330 offers wireless communication via NFC® and Bluetooth® through the app INOR Connect. How do I know which version of the IPAQ C330 I have? By looking at the article number of the product you can see which version it is. The article number of the first version ends with 0 and the second version ends with 2. The difference between version 1 and 2 is that version 2 supports wireless communication via NFC® and Bluetooth®.